Black Rose Wars is a tactical fighting game among aspiring mages striving to become the next Great Master of the Lodge. Developed over the last three years, it features solid mechanics, tried and tested in numerous trade shows and in many different groups of playtesters. In Black Rose Wars, there are lots of different ways you can win. It's up to you to find the method that best suits your strategy, successfully completing missions, defeating enemy mages or destroying the rooms of the lodge. But beware... because the lodge may get the better of you. today we go on with the exploration of the dark rooms of Inferno, after our first trip, where we visited the Red rooms, this week we will take you to discover the dark Gray rooms. This area is located between the Inferno gate and the Acheron river and is inhabited by the Ignavi, those who in life, out of cowardice, did not take sides neither for good nor for evil ... among these there are also angels who took no place in any faction during the Lucifer rebellion. Because of their cowardice, these souls are condemned to run towards a banner they will never reach, while large bees and wasps sting them all over the body. In a game of Inferno, you can activate this room to deal 2 damage to a target in an adjacent room. Two extra damage during activation can be precious especially to give coup de grace or simply place wounds for the purposes of the killing ranking. It may seem a little power, but it is not; also this is one of the few rooms of Inferno to not even inflict disadvantages to those who activate it! In this Room, heretics are punished or those who denied the Church and who worshiped other doctrines, cults, and sects. As their bodies were burned at the stake of the earthly courts, their souls are doomed to burn forever in flaming sepulchers... definitely not a beautiful circle! Activating this room a Mage, listening to the predictions of the damned, will be able to look at the next 2 Lucifer Action cards, and suffering 1 wound from him, he will be able to put them back on top of the deck in the order he prefers. This room allows a check on the actions of Lucifer not indifferent, knowing his actions will help you both as a group and as an individual, being able to take advantage of Lucifer's moves to turn the game to your side! A Mage who activates this room will be able to summon a Harpy under his control, and by taking 1 wound, he will be able to make it act immediately. The Harpies are very fast but frail Demons (movement 3 and 2 wounds) and taken individually they do not inflict much damage, but their unique ability allows them to inflict more damage for each other Evocation in the room they are in, up to a maximum of 3. A Mage very oriented on the Evocations and who knows how to move the Harpies wisely can launch devastating attacks exploiting this hard-to-handle but rewarding Demon! And even this journey through the Inferno rooms is over, next week we will continue the exploration but in the meantime continue reading, we must tell you other important things! At the moment according to the reports of our partners, all the shipments of the I wave orders are finished, so who has not yet received his package, you will receive it shortly. If too many days should pass, and still nothing has arrived, please contact us as always on our support page! The last update has generated some confusion among you, so I wanted to remind you that everything that was said in the previous update and in this only concerns the backers who have chosen the expedition in two waves! If you do not remember which shipping option you chose (actually it may have been a while since you made a choice) I am attaching two useful images to trace the type of shipment you chose. in this case, you chose the unique wave shipping so you will receive BRW this summer. In this case you chose for the 2 waves shipping! I hope that everything has been useful to you until the next week update and remembering that Dungeonology KS campaign is currently on-air, our new game set in the world of Nova Aetas and BRW but with a more cheerful style! As our backers, you are entitled to a $ 5 discount on any pledge and EB, all you need to do is pledge with the same account and email address you used for BRW (that is mandatory to obtain the discount)! With this update, we will begin to analyze Inferno's contents in more detail starting with the new rooms in which you will have to venture to beat the terrible Lucifer. As we did during the KS campaign in each update, we will examine the rooms of a single color, and today we will start with the infernal color par excellence... the Red! Important note! Given the setting inspired by Dante's Divine Comedy, we decided to leave the names of the rooms in Italian to immerse you even more in this fascinating setting. We could not start except the Gate of Hell! This dark and lugubrious cave is the crossing point of every soul destined for hell. There are as many ways as there are many roads that lead sinners to end up in the worst of places! During a game, you can activate it to draw three cards from your Grimoire and choose two to hold in your hand (the discarded one will go into your Memories), but then you will suffer a wound from Lucifer. This room, for a meager tribute of blood, will allow you to thicken your hand, and can be very useful if you have based your deck on schools that do not let you draw many cards, such as Destruction or Transmutation, but it also offers exciting combos for those schools that allow you to control your Grimoire and Memories. In this putrid Circle live the souls who have succumbed to their Ira, they are immersed in the mud and in the unhealthy fumes of the Styx swamp... pay attention to where you put your feet when you enter! Activating this room, you will yield to your instinct, and you will be able to move by one and attack another Mage who will re-inflict a wound to you immediately. This room will surely be loved by Transmutation Mages who, once powered or turned into an Abomination, will be able to exploit their physical attack once more per Turn. Also, remember that Lucifer is considered a Mage for targeting rules! Immersed in the blood-red waters of Flegetonte, the murders live their eternal punishment tormented by the Centaurs, who will strike them with their disks if they try to emerge from the blood! A Mage who activates this room will be able to summon a Centaur, and by taking one wound, he will be able to let the Demon act immediately! The Centaurs are one of the most interesting Summon of this expansion: they move 3, and they have 3 wounds, but their attack (2) allows them to hit all the models in a room. Do you think they are strong? Using Demonology will there be to have fun with the Centaurs? Well, you have not seen what they can do when Lucifer controls them! For this week it's all about Inferno, next week we'll continue with 3 new rooms. But don't stop reading, we have other news to give you! At the moment shipments are still in progress all over the world. In Europe, they finally started a few days ago, and our partner informs us that they plan to finish departures by the beginning of next week, so still, a little patience and the Rose War will arrive in your homes! To date, USA Backers should have received their copy, but we have some of you who report that nothing has arrived yet. If you are an American backer and have not yet received BRW, open a ticket here, and we will provide you with your tracking number, and we will follow the evolution of the situation with you until you receive your box! Finally for Australia, Asia and the rest of the world, even here the shipments have finally begun, but we do not have a definitive report for the timing of their completion. Probably it will arrive the next week :). You know we care a lot about the quality of our products, but unfortunately, things don't always go the way we hope! We have taken note of the errors that have been reported to us, and we are preparing, together with Marco, an updated version of the Rulebook and the Codex Arcanum which will be downloadable for free from our website. As for the cards that checked for errors, we decided to reprint them with the second wave, so you will find them in the Sator Box. We are still compiling the complete list of errors, but soon we will be able to give you the full list of the cards that will be corrected with the II wave. Given this initial response we decided to take more time to check the material of the II wave to avoid as much as possible getting you to receive incorrect material, so we can assure you that we will pay more attention to all the texts of SGs and add-ons. In the meantime, we are collecting all your requests for replacement of the broken/missing material, and once a complete list has been drawn up, we'll start with the shipments. Now that's all guys! See you next week for a new update! this week should be the one, we’re keeping our fingers crossed that some of you will start receiving your BRW packages. "Greetings Black Rose Wars Backers! As of March 15, 2019, we are preparing to pick, pack, and ship Black Rose Wars reward packages out to US backers. We expect to begin shipping this coming week, March 22, 2019. If we run into any snags, we'll provide an update to Ludus Magnus so they can let you know here. All order information has been forwarded on to our foreign partner depots for this project. We will be providing updates once we receive confirmation of start dates from our partners worldwide. You should receive a shipping notification to the email you included in your survey or pledge manager when your package label is printed or scanned through the local facility. Your package will typically leave the facility 1-3 days after your label is created. Based on your location, shipping times will vary. Please note it is extremely difficult to assist you in the comments, so please submit your shipping inquiries to us at Status@shipnaked.com. This is key for timely assistance. We too are waiting for extra copies and can’t wait to share the initial feedback on the game with you. But don't worry, while patiently waiting for our copy of BRW, we’ve been keeping busy tying up all the loose ends for the second Wave. This expansion has sparked our enthusiasm here in the studio. Beating Lucifer in his own territory is almost impossible, it will be a true test of survival for all mages. Only the best will succeed. Inferno significantly heightens the difficulty of the game, speeding up the conclusion times. But let’s start from the beginning, with what’s in the box. First of all, the miniatures: Lucifer, Barbariccia, 3 Centauri (Centaurs), 5 Farfarello and 8 Arpie (Harpies). Lucifer is a huge model, able to compete with Crono, one of the most beautiful miniatures sculpted by our studio. And considered a mage for all intents and purposes. Barbariccia is the most annoying character in the game, able to activate Lucifer outside of his normal game turn. The Centauri are few but very dangerous, inflicting widespread damage on all models in the room where they attack. Farfarello is able to destabilise rooms for his Lord, and each time he attacks a mage, he places a black cube in whichever room he finds himself. The Arpie on the other hand draw their strength from each other. They are characterised by excellent mobility, inflicting an extra wound on their target for every other harpy in the room. Malacoda inflicts 5 wounds for each attack he makes, and if he defeats the target mage, only Lucifer earns Power Points, Cerbero heals one wound each time he inflicts them. Each of Lucifer’s evocations are counted and although Lucifer can be left without any evocations during the game, this will only infuriate him more. By playing Inferno, players will earn Power Points from the evocations in two distinct ways: by killing an evocation (all players receive points) and through the secret quests drawn at the start of each game (13 in total). Moreover, all the evocations can be summoned through the new rooms, or, in the case of Malacoda, Lucifer and Barbariccia, through spells. However, Lucifer and Barbariccia can be summoned by a forgotten spell only in the standard games. In the next updates, we’ll continue to explore each component of this expansion. Shipment and Pledge Manager update! Welcome to a quick update to let you know how the 1st wave shipments are going! We’re tracking the progress of the ships, just like you, and apart from the ship headed for Europe, which is running a little late (it’s currently in Malaysia), the other have arrived or are about to arrive, and we have an ETA for all the missing ships set for the 25/26th February. HOWEVER we must inform you of an important change: we need to move the closure of the PM forward to 1st March. Shipnaked has in fact informed us that until the PM is closed and all addresses have been confirmed, it cannot proceed with the fulfilment and therefore consignment of the 1st wave boxes from the ports to your homes. So as not to make you wait any longer, we have therefore decided to move the closure of the PM forward by one week. We apologise for any inconvenience, but we are sure you’ll find a way to make the most out of these last few days to complete your purchases. So, remember: the PM will close at midnight (EST), 1st March 2019! Once the PM has closed, within 2 or 3 days you’ll receive an email to confirm or change your address. For subsequent changes, you can contact our support center as usual. We also remind you that it will not be possible to ship to PO Boxes, so be sure to make any necessary changes. If your PM hasn’t been reopened yet, we remind you that the opening procedure will allow you to make last-minute purchases! 1 - Click on “Edit Your Address”. 2 - From there you will see the confirmation page. 3 - When on the confirmation page, you need to scroll down and click “Edit Add-ons”. Thanks again for your collaboration and don't worry, the Rose is on its way, it’s just around the corner!!! As usual, we leave you with a few juicy images from Inferno :). The Autumn is taking its second trip to Canada, 2 weeks ago has already delivered the first load of boxes destined for America continent. The work for the second wave’s materials (all SGs, Pets and the Expansion “Inferno”) is almost completed, we are very satisfied for the results of design and sculpture, and we are confident that you will agree with us. Soon we will publish all the Magic cards, so that you can help us with the review, hoping that you will repeat the brilliant work you did for the first wave. The reopening of the Pledge Manager was asked and urged by many of you: we were impressed by the great support you continue to show us, and we want to thank you very much and give you credit for this. 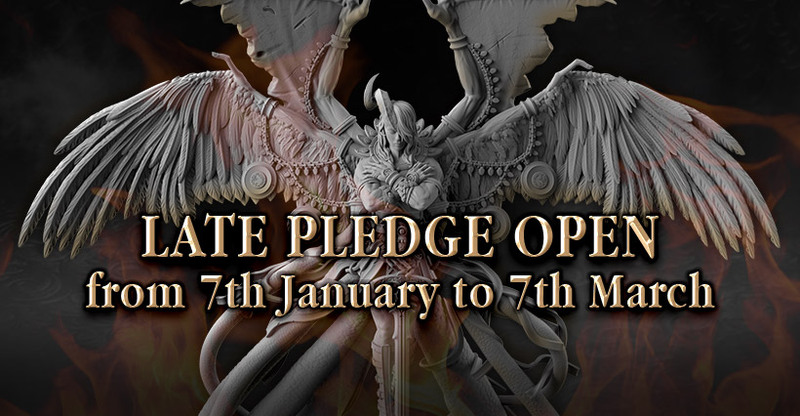 The Pledge Manager will stay open until March 7th, you will have time until this date to stock up on reagents and ingredients for future battles! March also brings big news about Ashes, our online fanzine. In fact, as in the best RPG games, it has gained enough PX to improve and “materialize” in paper! The backers who came to visit us in Essen appreciated so much the paper version of the magazine they found at the fair, that finally we decided to please them. In addition to the free online download, starting with the release of Ashes n° 7 you can pre-order a paper version of the fanzine on our online shop, receiving special attachments which will vary from number to number. Our cultist Howard is attracted to forbidden rituals that would nullify anyone’ sanity, going beyond the limits of any average human being. Because of these unhealthy interests, obscure whispers led him to make alliances with evil hordes. In company of the faithful Dagon, he travels in disguise under the name of Horvath and goes deeper and deeper into the world of Dark Ritual! Howard (aka Horvath) is ready to be bad! The last project by Dark Gate Games, friends with whom we have already collaborated in the past creating a crossover between Vampire Hunter and our Sine Tempore, is a “One vs Many” asymmetric game, 2 to 5 players, which supports a system of solo gameplay, in which a player controls a legion of creatures of darkness. The other players will be the defenders who will stand between the demonic legions and the terrorized villagers. The campaign is going very well, having already unlocked 35 SG goals, to be added to the high quality material and the beautiful miniatures of the basic game. The game can be already played in several languages, but they are planning to add more, including Italian. We hope this crossover will please many of you who have already pledged the game, or at least let you know a valuable project that maybe had not appeared in your radar yet. Let’s conclude such a dense update with juicy Inferno spoilers, a gallery with some Inferno inhabitants, enjoy.